Description: Photo Browse and Paste with Staxofax, the complete solution to your digital photo management. There are three problems with other photo browsers.. 1. The thumbnails are too small. 2. There is no way to paste your pictures into emails or documents. 3. There is no way to find the picture you are looking for. Staxofax overcomes all three. 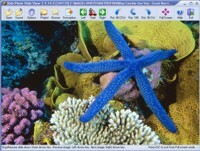 Description: Photo-Lux is an easy-to-use but powerful and fast image viewer and more. The following graphics formats are supported: BMP, CEL/PIC, CUR,CUT, DIB, EMF, FAX, G3N/G3F, GIF, ICB, ICO, J2C/J2K/JP2/JPC(JPEG2000),JPC, JPG/JPEG (RGB, GrayScale, YCbCr, CMYK, YCbCrK), JFIF/JIF, PBM,PCD, PCX/DCX, PSD/PDD, PSP, PGM, PNG, PPM, PXM, RGB/RGBA, RLA/RPF, RLE,SGI/BW, TGA, TIF/TIFF, VDA/VST, WMF, WBMP, XIF. Plus, it supports a lot of Camera RAWs formats. Description: Have you ever wanted to see all the digital photos and other graphic files without opening each up individually? Able Photo Slide Show displays your graphic files continuously without you doing anything. You just point it to a file in folder, say how long to display each picture, select transition effects and then sit back and watch. If a picture is too large or less for your screen, it is resized to fit. It can also create standalone slide show.